A typically English recipe and sometimes called pikelets in Northern England, though real pikelets are thinner and irregular in shape. 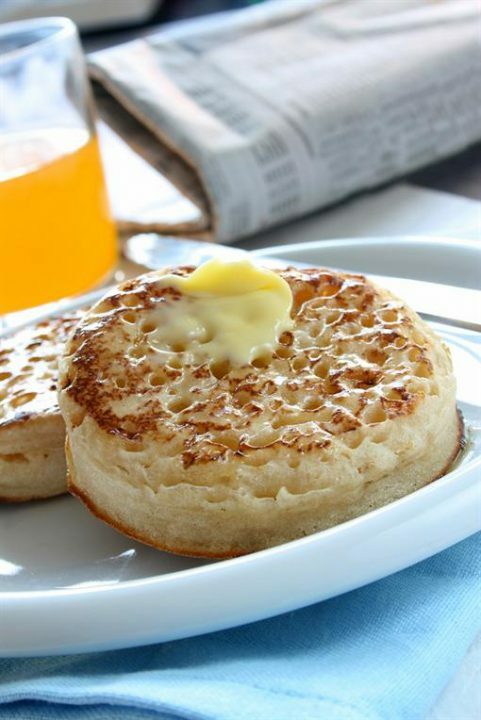 Crumpets have a distinctive honeycomb texture, caused by the action of the yeast and the raising agent and the sudden heat from the griddle or pan on which they are cooked. These can be served with jam, cream cheese or cooked breakfast and should be toasted first. If you don’t have a crumpet ring you can make your own from a small tin (eg tuna or baby baked bean can) by removing both ends and the label. It is not advisable to scrub a griddle to clean it; but the surface can be cleaned by rubbing it over with fine table salt (not if it has a non- stick coating). In the unlikely event that you have left over crumpets – these can be frozen for up to 2 months.